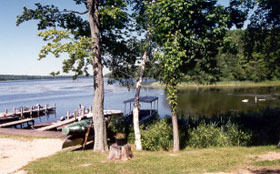 Rent one of Sunset Bluff's cabins or cottages, which include fully-equipped kitchens, bed linens, private deck, plus your own picnic table and outdoor grill. You have everything you need--just bring your clothes, food, and be ready for fun! Sunset Bluff Resort loves families, and for those with small children, they offer high chairs, cribs, and babysitting services. The playground and heated pool will keep kids occupied for hours. Or play badminton, horseshoes, volleyball, and shuffleboard--you'll never be bored! 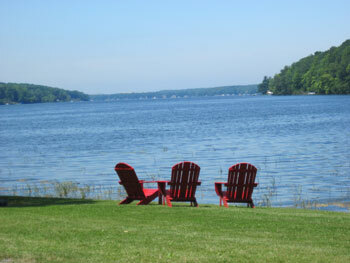 Sunset Bluff Resort has all units available from May 15 through October 31, with select units available in the off-season. You're invited to come and experience the vacation of a lifetime, at a very affordable price. You will feel like Sunset Bluff Resort is your home away from home. If you've always dreamed of getting married against the backdrop of a beautiful lake, then Sunset Bluff Resort is the place to call. 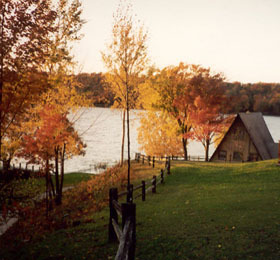 The name says it all--this charming resort sits on a wooded bluff overlooking Upper Hamlin Lake, where you can view some of the most spectacular sunsets around. All 40 acres of Sunset Bluff Resort are in a peaceful, quiet area which is perfect for your special day. Sunset Bluff Resort would be happy to be your wedding venue in the off-season months of May, September and October. Imagine getting married in the spring when the flowers begin to bloom...or the fall when the glorious colors paint the countryside. 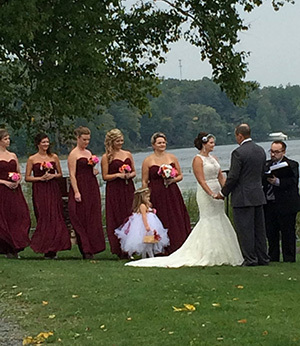 And with Hamlin Lake in the background, your wedding can be the special moment it deserves to be. Sunset Bluff Resort has cottages that can accommodate up to 100 wedding guests, so everyone can be together in cozy and comfortable surroundings. For the venue itself, Sunset Bluff can seat up to 150 wedding guests. There are very few places in Ludington where you can get married on a lake, so let the friendly staff at Sunset Bluff Resort help make your wedding dreams come true.